Arizona Sleeping Beauty Turquoise Cluster Ring in Platinum Overlay Sterling Silver 5.00 Ct.
Arizona Mojave Black Turquoise (Ovl) Bangle (Size 7.5) in Platinum Overlay Sterling Silver 18.000 Ct.
Arizona Sleeping Beauty Turquoise (Ovl 2.35 Ct), Amethyst Ring in Platinum Overlay Sterling Silver 5.750 Ct. Silver wt 5.09 Gms. Turquoise (Ovl), Multi Gemstone Floral Marvelous Ring in Rhodium Overlay Sterling Silver 4.887 Ct, Silver wt 5.14 Gms. Arizona Sleeping Beauty Turquoise (Ovl 4.75 Ct), Blue Diamond Ring in Platinum Overlay Sterling Silver 5.250 Ct. Very Rare Size-Arizona Sleeping Beauty Turquoise (Cush 14x14 mm ) Ring in Platinum Overlay Sterling Silver 9.000 Ct.
Anhui Turquoise (Ovl) Tree of Life Pendant With Chain (Size 18) in Rhodium Plated Sterling Silver 8.750 Ct.
Arizona Sleeping Beauty Turquoise (Ovl 1.75 Ct), Tsavorite Garnet Ring in Platinum Overlay Sterling Silver 2.750 Ct. If you’re born in December, but not a huge fan of Tanzanite jewellery, you’re in luck! December has two birthstones – and its secondary gem is stunning Turquoise, so indulge in luxurious Turquoise jewellery and treat yourself to everything from Turquoise Earrings and rings to Turquoise bracelets and pendants. The robin egg hued Turquoise is considered by some to be a symbol of good fortune and success, believed to bring prosperity to its wearer. Turquoise is also considered one of the oldest protection amulets, and is believed to give strength and peace to the wearer, while others say it offers sensitivity to the spiritual world for anyone that wears it. In this case a beautiful Turquoise pendant and necklace is the answer. This stunning blue-green hue is recognised across the world, and it’s prized for its beauty and symbolism. It is favoured among those that prefer colour gemstones and who want to own something a little bit different. 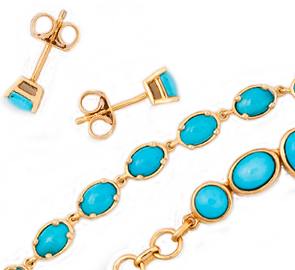 If you really want to treat yourself or somebody else this month, Tanzanite or Turquoise jewellery UK is definitely the way to go and at TJC, we have a gorgeous range of items to choose from. Ranging from delicate Turquoise Earrings to Turquoise statement pendants, you're sure to find something you love in our beautiful collection of two of the world's most coveted gemstones.